Montello, WI – If you are an aquaponic farmer or gardener or hoping to become one, the aquaponics.com/store/ offers everything you need! Nelson and Pade, Inc.®, the Most Trusted Name in Aquaponics®, has been offering information and products on their website, www.aquaponics.com, since 1996. Over the years, the website has evolved and the online store has grown. In addition to complete systemhttps://aquaponics.com/aquaponic-systems/s, equipment, training, books and more, Nelson and Pade, Inc.® has recently added hundreds of new products to their online store. Known for offering proven aquaponic systems, Nelson and Pade, Inc.® has home and school systems available to purchase in the online store. Larger systems for schools, missions and commercial ventures are available from Nelson and Pade, Inc.® as well. Specifically included for DIYer’s, the Aquaponic System Parts category has an abundance of components that you can use to build your own aquaponic system. This includes tanks, air diffusers and air pumps, water pumps, seals, heaters and much more. If you are growing indoors, whether in a greenhouse or building, you will find grow lights, dehumidifiers, environmental monitoring and bio security equipment in the Indoor Growing Equipment category. All aquaponic growers need supplies like fish food, pest control, fish nets and grow cubes. These products can be found in the Aquaponic Growing Supplies category. Additionally, books, monitoring and alarm systems and water quality test kits are all available. Of special interest to many, is the just-added Bargains and Used Equipment category. Aquaponics.com/store/ also offers registration for the Aquaponics Master Class® offered by Nelson and Pade, Inc.® To date, people have travelled from over 100 countries and all 50 US states to attend this comprehensive class. Get growing! Visit www.aquaponics.com now! 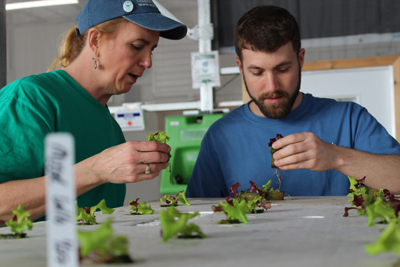 Nelson and Pade, Inc.® provides Aquaponic systems, equipment, supplies, training and support to individuals, entrepreneurs, governments and schools who want food security, food quality and a positive return on their investment. Unlike traditional agriculture, they use 1/6 of the water to sustainably grow 8 times more food per acre, without the use of pesticides, herbicides or chemical fertilizers, year ‘round, in any climate. Nelson and Pade, has the has the distinguished honor of receiving the “Sustainable Product of the Year” award in 2014, 2017 and 2018, for their Clear Flow Aquaponic Systems®.